White Church Lane is a last redoubt of Whitechapel’s rag trade, still (or until very recently – it’s hard to be up-to-the-minute) sporting shopfronts pertaining to manufacturers and wholesalers: Tip Top Casual Wear, K. K. Hosiery Ltd, Raw Blue Ltd, N.E.W.S. Urban, Mekyle (Bayfield Trading Ltd), Denim World, Alish (wholesale jewellery and accessories), HIP HOP Collections (wholesalers of American street wear), Senior Style Ltd, Abraham Posh Lady London. 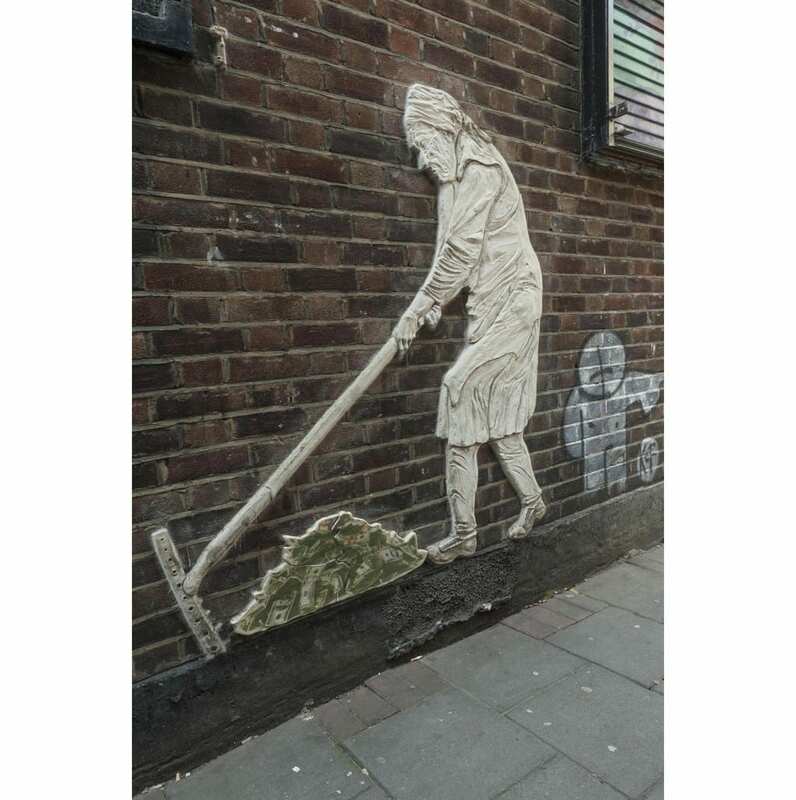 There is also an efflorescence of street art, work from 2012 facilitated by Global Street Art’s negotiations with property owners. The road’s origins are as the north end of Church Lane, the only north-south route through the parish, in existence by the seventeenth century to link Well Close to Whitechapel High Street. The northern stretch may not have been much built up until the 1660s and back building suggests density and low status – Church Rents or Maidenhead Court (later Dyer’s Yard), and Hatchet Alley (later Spectacle Alley, now Whitechurch Passage) which had Adam and Eve Court on its south side, and there was Back Yard off the lane’s west side. All this had gone by 1800. 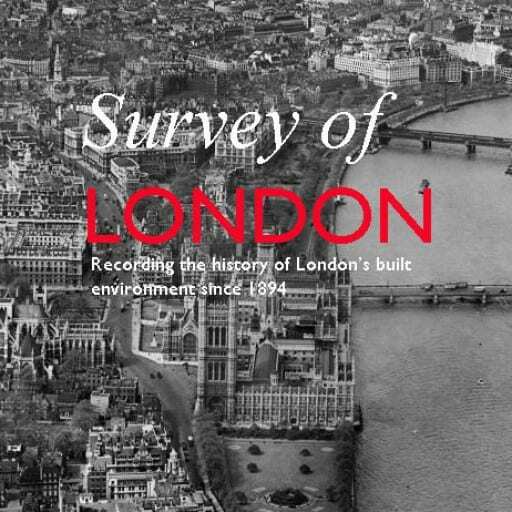 Eighteenth-century property holders included Joel Johnson, the carpenter and architect who worked on local churches and the London Hospital. There was a sugar house near the north end and the Fir Tree public house was at the south end of the east side, adjacent to a site taken in the 1840s for John Furze’s St George’s Brewery (subsequently Johnny Walker’s St George’s Bond, now Hult International Business School). The north end of Church Lane’s east side was redeveloped in the early 1850s and the south end was obliterated by extension of the Commercial Road in 1869–70. Redevelopment since has been piecemeal, with a central section of the east side replaced in 2000-2 by the Naylor West flats, designed by Michael Squire and Partners for Ballymore Properties. That block’s artless greyness was a herald of cleansing, and sites at the street’s south end on both sides are now destined to host tower-block flats. 4-8 White Church Lane, buildings of the 1850s with painted shutters of 2012 (© Derek Kendall, 2016). The north end of the street’s east side is anchored by what was St Mary’s Clergy House, now a Japanese restaurant, a building of 1894–5, Herbert O. Ellis, architect, that was an adjunct to the parish church that stood on the site of Altab Ali Park (see blog post of 15 April 2016). Next door, No. 4 of 1852–3 was built to be a sale room for Isaac Bird, auctioneer. Hunto has painted its shutter. A workshop behind an entrance passage at No. 4A was built in 1899–1900 for William Nay, a mirror manufacturer, and converted to be a necktie factory in the 1920s. The front-door shutter has a figure by Tizer. Next door at No. 6 the shutter art is by 2Rise, whose tag has also been prominent on the south side of Whitechurch Passage. Nos 8 and 10 were built in 1852 by Jabez Single of New Road, houses with shops first occupied by Mark Berry, a zinc and tinplate worker, and James Fullerton Barber, a printer. Alterations and extensions to the rear were made for a bedding factory that was later a silk-screen and joiners’ workshop. Dining rooms at No. 12, run by Alfonso Pappalardo in the 1930s, were held from the early 1940s to the early 1950s by Narian Singh for one of the area’s first Asian-run restaurants. At the time Bonn & Co Ltd had a large biscuit warehouse behind Nos 16–32. 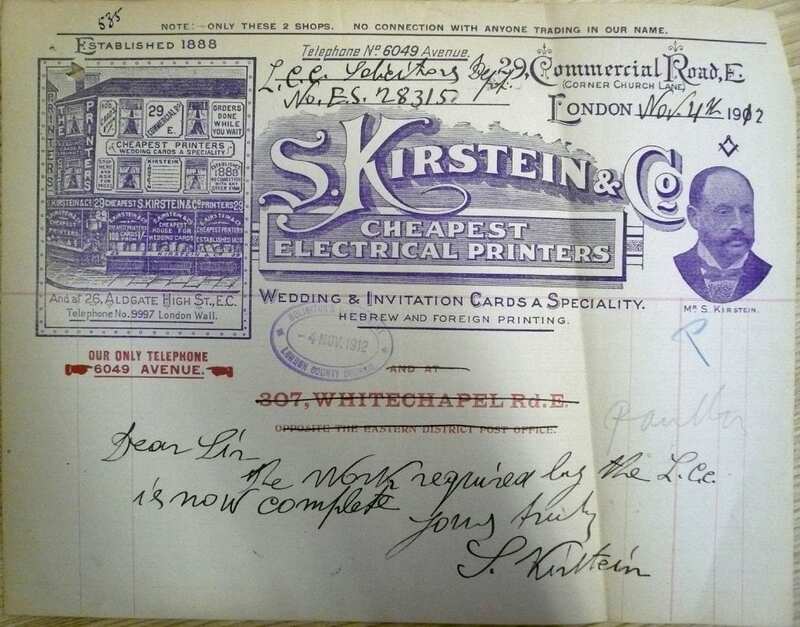 Solomon Kirstein’s letterhead, showing 29 Commercial Road (Tower Hamlets Local History Library and Archives, Building Control file 41978) and Kirstein Mansions, 34-40 White Church Lane, shops, tenements and workrooms of 1911 built for Solomon Kirstein (© Derek Kendall, 2016). A house and shop at No. 34 were the premises of Henry Bear, a tobacco manufacturer here from the 1840s to the 1880s. 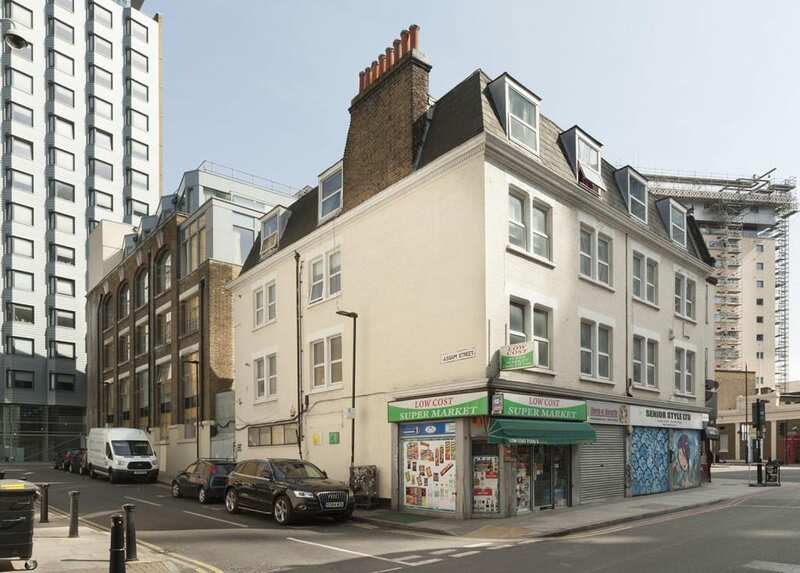 He acquired the freehold of the buildings on the sites of Nos 34–40 and an empty site at 29–31A Commercial Road and in 1901 a lease was transferred to Solomon Kirstein, a printer based at No. 38. By 1902 Kirstein had built three three-storey houses or workrooms with shops at Nos 29–31A, with Herbert O. Ellis as his architect. Kirstein took the shop at No. 29, living above with his wife, three children and a servant. It was not until 1911 that Kirstein redeveloped his Church Lane frontage as Kirstein Mansions, shops, tenements and upper-storey workrooms, this time with John Hamilton & Son, architects. Around 1970 David Abraham began selling knitwear at No. 34. In 2015 the David Abraham Partnership put forward a redevelopment scheme for the whole site proposing a seventeen-storey tower designed by Stock Woolstencroft. 3 White Church Lane, with embellishments of 2012 (© Derek Kendall, 2016). On White Church Lane’s west side a small bomb-damage replacement building of c.1960 at No. 3 was decorated in 2012. The entrance-door shutter has wings by Probs, and the south return to Whitechurch Passage a head by Hunto and ‘The Lady’, a low-relief ceramic by ChinaGirl Tile. ‘The Lady’, by ChinaGirl Tile (© Derek Kendall, 2016). Further south, first-floor blind arcading in a little-altered stock brick front at No. 17 was built around 1840 for Charles Marshall, a veterinary surgeon who probably dealt largely with horses. The shop is infill of what was an open carriageway into the twentieth century. Stables to the rear were rebuilt for Marshall’s successors. Around 1880 Simon Cohen, a pastry cook based at No. 32 across the road, established a refuge for homeless immigrant Jews in a house at No. 19. Named the Poor Jews’ Temporary Shelter, its closure as insanitary in 1885 led to fundraising that permitted the establishment of better premises on Leman Street. Other properties continued to be used as ad hoc refuges or lodging houses. In late 1885 a Shelter employee took five immigrants from Brest-Litovsk to 11 Church Lane, then occupied by Paul Meczyk, a printer, only for them to be turned out on to the street. By 1891, in which year he fell out with the Shelter Committee, Cohen had converted the house at No. 19 to be a ‘Beth Hamedresh’ (Study Circle and Synagogue). He acted as his own builder and carried out further works in 1895–6. But this did not last. In 1898–9 Jacob King redeveloped the site with 9 Manningtree (formerly Colchester) Street; Arthur C. Payne was his architect. On the corner (No. 21) there was a Horse and Groom pub by 1760. The two-storey pub that had been run by Henry Levy was rebuilt for King in 1902 to designs by Ralph J. Miller, architect. It was a Truman, Hanbury & Buxton pub by 1910. 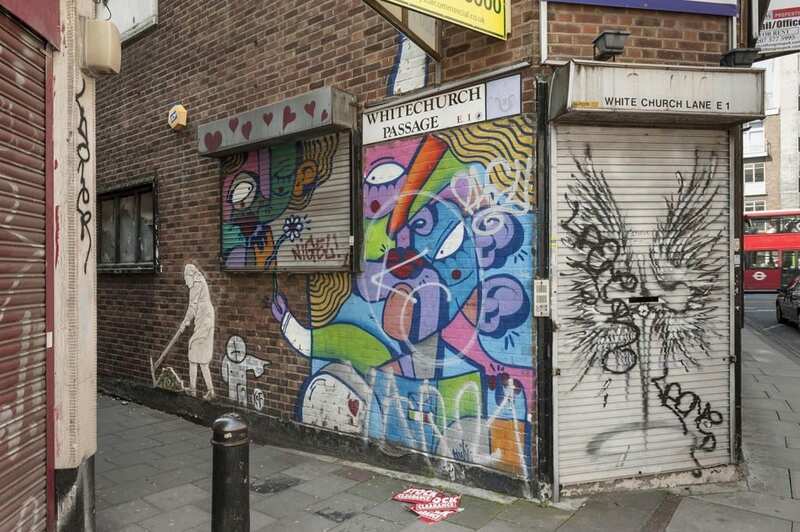 19-37 White Church Lane and 27 Commercial Road, demolished 2016 (© Derek Kendall, 2016). Fishel K. Abrahamson converted a house at No. 29 to be a synagogue in 1895–6, and nineteenth-century houses at Nos 35–37 were part rebuilt and perhaps refronted in 1915. 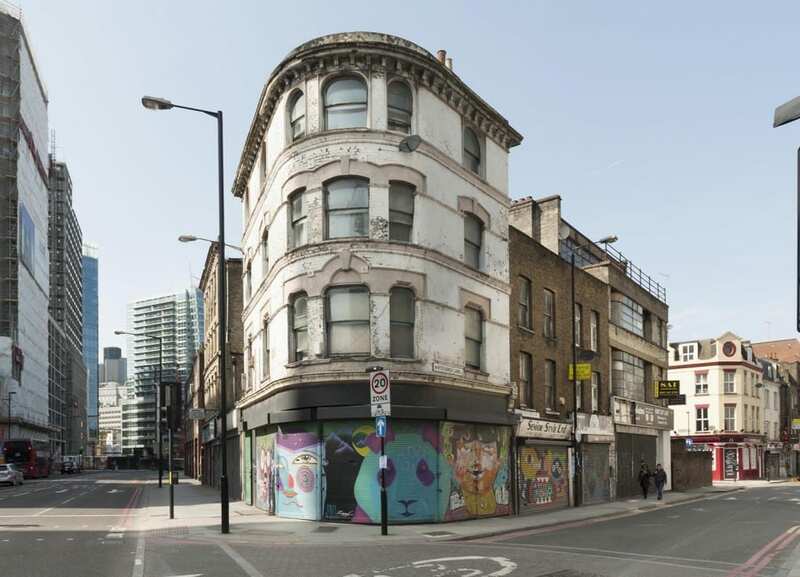 The four-storey corner warehouse that was 27 Commercial Road had been built in 1872–3 and more warehousing went up to its west in 1876–8 at No. 27A which accommodated Hyam Goldstein’s cap factory, then Aaram Bagel’s boot factory, Burstein Isaac & Co.’s cigarette factory, and tea packing. Nos 29–33 Church Lane and 27A Commercial Road were redeveloped in 1936–7, with George Coles as architect for M. Freedman, a gown manufacturer. Coles is best known as a cinema architect, and there was a faint echo of his Art Deco skills in the façade fenestration of the factory and showroom block. Shutter painting of 2012 here was by Malarky, Chase and Billy. 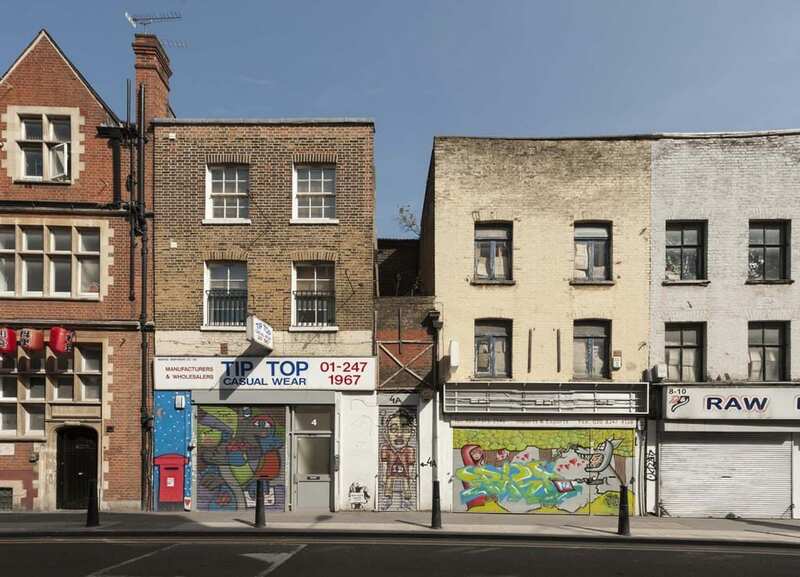 A scheme for redevelopment of Nos 29–37 and 27–27A Commercial Road was prepared in 2012, approved in 2014 and refined in 2016 prior to clearance of the whole site, now complete. Plans initiated by Reef Estates Aldgate Ltd propose a 270-bedroom hotel in a 21-storey tower to be operated by Motel One, a German firm. The architects are Stock Woolstencroft.